When I first spied this Flourless Chocolate Cake with Marshmallow Frosting, I knew my family could make it disappear in a New York minute! 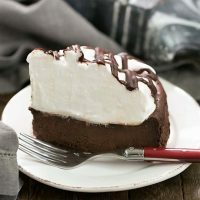 With a rich, dense chocolate base and a made from scratch marshmallow frosting, this is not for those watching their calories as it’s as decadent as it looks! A sliver is all you need! It was time for our annual summer book club dinner. I always volunteer to bring dessert and chocolate is extremely popular with this crowd. Plus, any leftovers would please the home team. 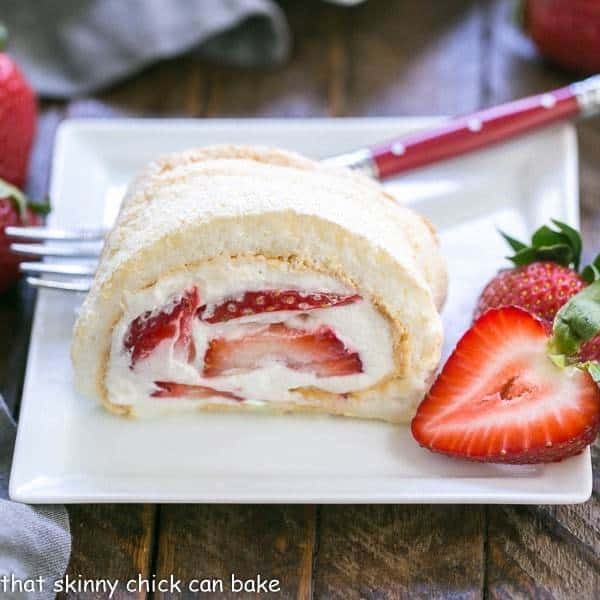 This is one of those desserts that can serve a crowd. Super rich, you only need a thin slice to satisfy your sweet tooth. The billowy marshmallow topping and chocolate drizzle make jaws drop when it’s unveiled at the end of your meal. Even the chocoholic hubby described this flourless chocolate cake with marshmallow frosting as extremely rich. So save it for a holiday or anytime you’re serving a crowd. And make sure to check my tips below, especially for making the frosting. I’ve made loads of other flourless chocolate cakes, some glazed like this La Bete Noire, others served with berries and cream like this Flourless Chocolate Cake from Princeville Hotel. But flourless chocolate desserts aren’t limited to cakes. These decadent Flourless Chocolate Turtle Cookies throw caramel and pecans into the delicious mix or how about a Flourless Chocolate Brownie topped with ice cream, chocolate sauce and toasted coconut??? Yeah, my mouth is watering, too! Since there’s no flour (duh!) in a flourless chocolate cake, your taste buds are getting a pure blast of chocolate flavor. Undiluted, unadulterated. So for this reason, buy a step up in quality. Chocolate Bars instead of chocolate chips. A European brand if you dare. As far as domestic chocolate, I primarily use Ghirardelli bars. Watch for sales around the holidays and stock your cupboards. The same goes for butter. European butter rocks, but it does cost more. Kerrygold Irish Butter has a higher butterfat percentage compared to traditional grocery store butters and is readily available. It’s more important to buy a quality chocolate, but if you want to spring for a top notch butter, try a European brand. Read your recipe as some so called flourless chocolate cakes actually have a couple tablespoons of flour. You will not want to serve one of those recipes to your gluten free guests or on Passover. Coffee enhances the flavor of chocolate. 1/2 cup of coffee will not make this cake taste like a mocha dessert, but instead will make the chocolate flavor deeper, more intense. 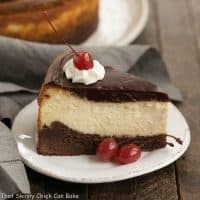 If you want even more chocolate intensity, use bittersweet chocolate instead of semisweet. 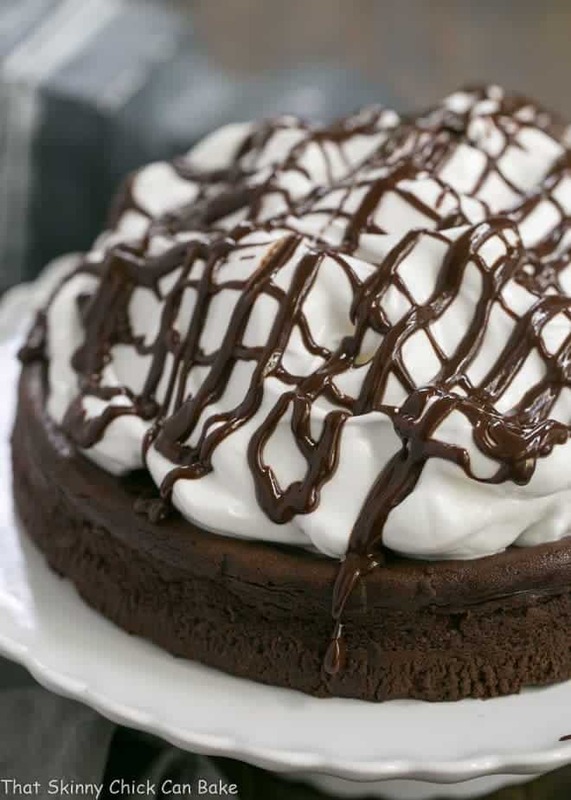 Many flourless chocolate cakes have whipped egg whites folded into the chocolate and egg yolks to lighten the batter. In this particular cake, the leftover egg whites are whipped into a fluffy meringue, AKA marshmallow, frosting. As with any meringue, the most important tip is to have all your bowls and utensils free from oils, grease and any bits of egg yolk. Any of the former will prevent the whites from whipping into a beautiful, billowy marshmallow frosting. I’d recommend separating your eggs one at a time, using two bowls (meaning don’t separate a whole egg over the bowl of egg whites). If you happen to get a bit of yolk into those whites, all of them are contaminated and you have to start over. Trust me, I’ve done that. It’s a nightmare when you don’t have an extra 6 eggs to spare in the refrigerator! A rich, dense flourless chocolate cake topped with a made from scratch marshmallow frosting! Put eggs, brown sugar and salt in mixing bowl. Place mixing bowl over the water from the double boiler and whisk to warm eggs, about two minutes. Transfer the bowl to the stand mixer and beat on medium speed for 5 minutes. On low, add the coffee and vanilla, then the melted chocolate. With a handheld mixer, beat on low then slowly increase to high to reach soft peaks, about 5 minutes. Remove from heat and continue beating until meringue has stiff peaks. Spread on cooled cake make peaks with a fork or offset spatula. 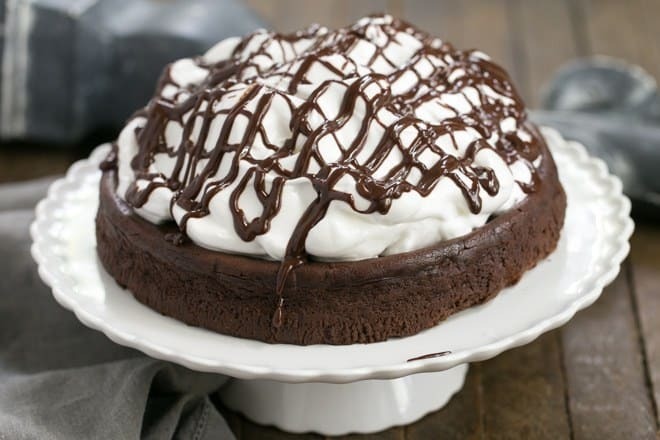 Drizzle with the melted chocolate. wow this looks amazing! Gorgeous colour contrast and amazing flavour! 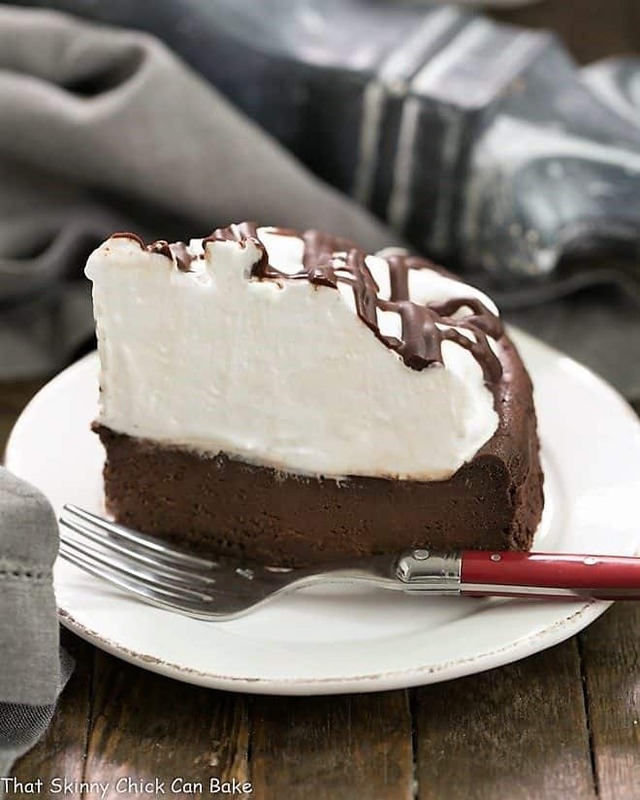 This cake is absolutely heavenly! So yummy for chocolate lovers. OMG that marshmallow frosting!! Gorgeous cake! What a gorgeous cake, the marshmallow frosting looks extremely decadent. The cake sounds like a perfectly chocolatey dessert. I will make it for a dinner party this weekend, my friends will love it! Well, I could make a meal on the frosting! Woo hoo!!! Great cake, Liz! This is my most perfectly ideal way to combine chocolate. Rich chocolate flavor in the cake, and all that fluffy marshmallow frosting. Wonderful! This is my most perfectly ideal way to combine chocolate. Rich chocolate flavor in the cake, and all that fluffy marshmallow frosting. Absolutely wonderful! Totally in love with this marshmallow frosting! 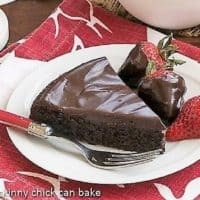 I love flourless chocolate cake and that frosting is over the top! This is making me drool!! That frosting flavor is a brilliant idea. This looks not only beautiful it looks delicious too. I love the marshmallow frosting on the flourless cake. I’m drooling over your photos of this stunning chocolate temptation Liz! I love flourless cakes and their tender texture. I’m heading over to your blog friend’s page now to discover more of her creations! How is the new kitchen coming along? I’m sure it is fantastic! I just adore recipes like this. The marshmallow frosting is a really good touch! Thank you for sharing! 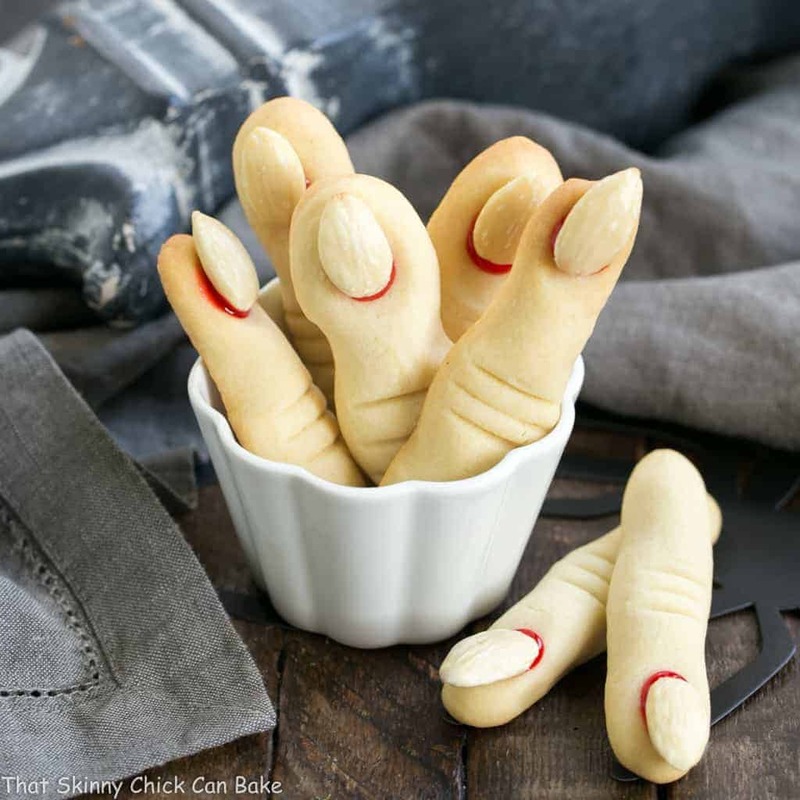 My husband will definitely love this … or anything chocolatey! Will definitely try this! Marshmallow frosting is my new favorite frosting! Oh wow that looks so epic! I can’t wait until Passover for this one! Great tips on baking this cake Liz! I love a good flourless cake and your marshmallow frosting looks perfect! I bought Kerry Gold Butter almost a month ago and haven’ t used it yet. Looks like i found the perfect recipe for it. I want to ask u What kind of baking pans do you use? 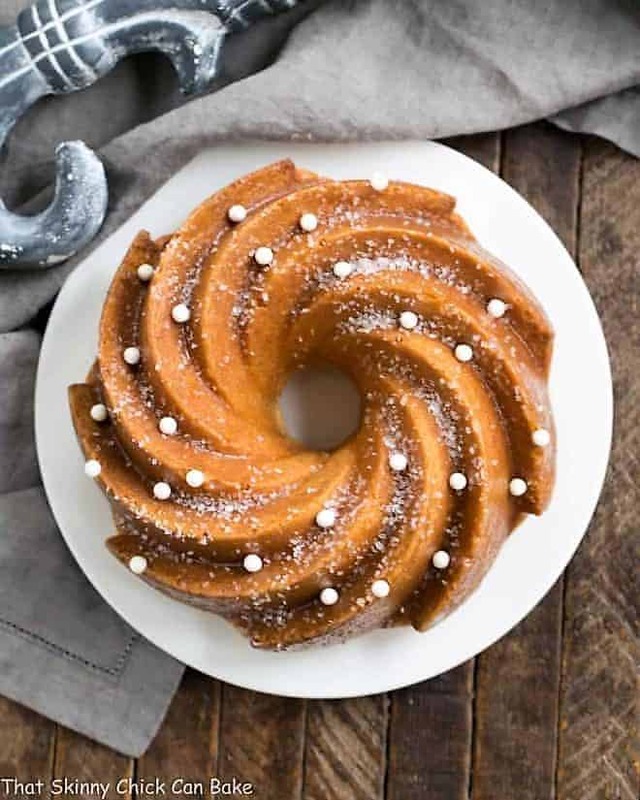 This cake requires a springform pan so it can be released easier for serving. The brand I own is Kaiser, but there are lots of good heavy duty options available. Hope you enjoy! Do you invert the cake when after you release the sides, and then peel off the parchment liner? 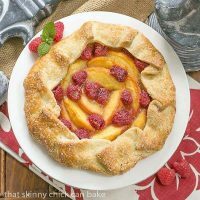 Novice baker here, so please excuse a silly question. Not a silly question at all! I do not invert the cake, but instead slide it off the base with a wide spatula. That process usually catches the parchment, too, and gives you an opportunity to work it off the bottom. Not easy to explain, but that’s my method. You could also invert the cake onto a cooling rack and peel off the parchment—that may be easier for you. 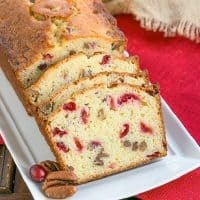 Just place the rack on top of the cake after removing the side piece and flip both the cake and rack over then remove the bottom of the pan and the parchment. Then you can place your serving plate on top and invert again. Hope that make sense! This cake is looking delicious. I would love to bake this cake for the coming occasion of mother’s day. Thanks for sharing the recipe.